The Stamina 7200 Magnetic Fusion recumbent exercise bike features a convenient walk-through design, a stable steel frame, and built-in heart rate monitoring. The large LCD screen shows feedback including time, distance, RPM, calories burned, speed, heart rate, and resistance level. The 12 preset programs are Manual, Interval, Mountain, Valley, Rolling, Fat Burn, Random, Plateau, Ramp, Fitness Test, 60% Max Heart Rate, and 85% Max Heart Rate. UPDATE:The 7200 has been discontinued and replaced with newer recumbent models. 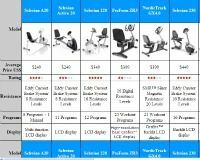 You can check out all of the popular Stamina exercise bikes here to find the one that best fits your needs. 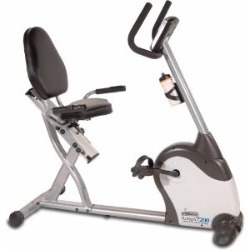 The Stamina 7200 Magnetic Fusion exercise bike features a steel frame, aluminum seat rail, and an oversized padded vinyl seat and back cushion. 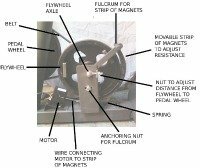 The magnetic resistance system is smooth and quiet. It is easy to change the load level (intensity) on-the-fly with the push of a button. The adjustable seat slides at a 45-degree leg angle for optimum comfort during pedaling, and the weighted pedals have an eight position adjustable strap. The reviews that stand out are from users who say this 53" long exercise bike has too much distance between the seat and pedals. Several smaller users at 5'1" and 5'2" said they could not reach the pedals even with the seat locked in at the lowest position. 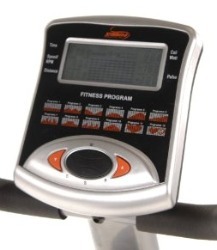 Otherwise, for average to tall users, the Stamina 7200 Magnetic Fusion is a comfortable recumbent. One other word of warning from current owners: this bike takes at least 2 hours to assemble. It isn’t difficult, but it does take a lot of time. Though the price varies from $299 to $369, there aren’t many bikes out there that can match the features and comforts of the Stamina 7200 Magnetic Fusion recumbent exercise bike. This is a great bike for most people to consider, with the exception of smaller individuals whose legs aren’t long enough to reach the pedals. In that case, we suggest you also review the Schwinn 220 at around $349, which is the nearest competitor in terms of price and quality. For a better bike, you can also check out the Horizon RC-30 at around $399 which scores a Best Buy.